12-Mar-2009 -- This is the 57th of a series of 83 confluence visits during our voyage from Nigeria to Europe and back to Nigeria around the entire African continent. It all started on 28 January 2008 at 11N 5E. Story continues from 0 32E. After spending two weeks at Tiwi beach we were heading to the Tanzanian border post Lunga Lunga. We crossed the border and were driving towards the city of Tanga. The road is very bad. 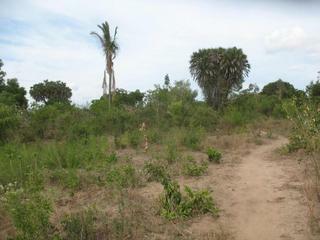 Several km outside the town is a turnoff to the village of Gombero; this road leads directly to the Confluence. We parked our vehicle 70 m from the Confluence and walked the remaining distance.